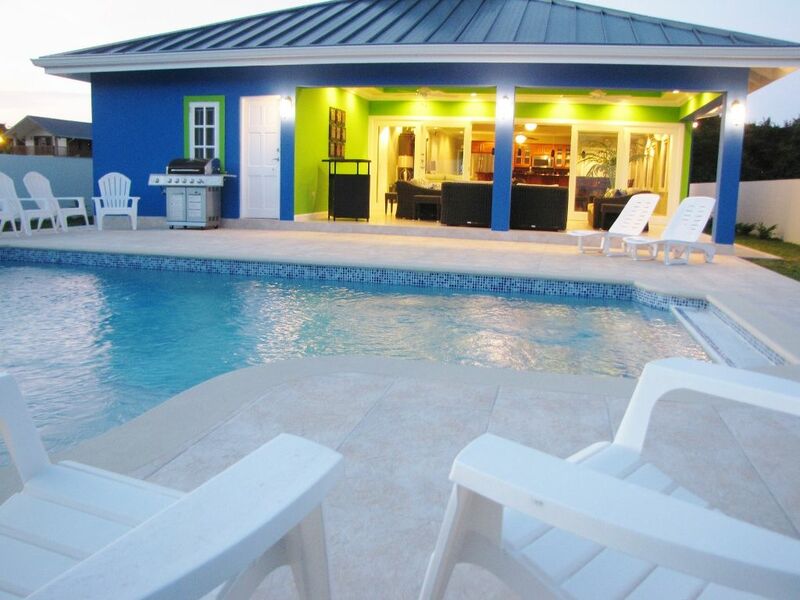 4 bedrooms, 3 shower bathrooms, sleeps up to 12 guests, close to beaches and airport. KINDLY NOTE : No Man's Land is no longer accessible from Samaan Grove. Blue Marlin Villa is a spacious, elegant and luxurious 4 bedroom villa in the Samaan Grove gated development, which has 24 hour access security. The villa is centrally located, with the airport and most popular beaches all being less than 10 minutes’ drive away. On entering the villa, you will immediately appreciate the bright, open and airy design as well as the exceptionally high quality and style of the construction, finishes, furniture and fittings. The Great Room opens to the porch and private pool. The wall and doors separating the Great Room and the Porch is all glass, providing exceptional visibility from the interior to the fun activities on the porch and the pool and pool deck. The villa provides all expected modern conveniences and more – full air-conditioning including the Great Room, high end kitchen with stainless steel appliances including dishwasher, granite counter tops and island bar, and full laundry facilities. All expected entertainment amenities are provided - satellite TV with large 51” HD flat screen TV, and DVD. WiFi internet access is provided. Blue Marlin: The villa is very spacious with over 2100 square feet (186 Sq M) of living space. The bright, cheerful tropical Caribbean colours will immediately make you relax and put you in the mood to enjoy your enchanting Tobago holiday. The 4 bedrooms have 1 King, 1 Queen, 1 Queen, 1 Queen & a Double/Twin bunk bed respectively. The Double/Twin bunk bed also has a roll-out trundle bed that can accommodate a child. The villa can sleep a multi-family group up to 12 including children. The quality of the furniture and furnishings is very high (everything was imported from Miami). There is a 51” flat screen TV service in the Great Room. Panasonic Split air conditioners are used throughout for their exceptionally quiet performance. The Great Room is air conditioned, with 2 split 24,000 BTU units. Two wide glass doors in the Great Room open out to the porch, and combined with the glass wall, allows for a fantastic open indoor-outdoor feeling as well as opening up the villa for fresh cooling breezes to flow through. The glass wall and doors enhance the light and airy feeling. The 28' pool has 3 sections - a shallow area that allows you to sit or lie with your chair or lounger in the water which allows you to stay cool while you tan and relax, a mid-depth area ideal for the kids, and even the deep end is only 4 1/2' suitable for non-swimming adults. Every expected amenity is provided and more. Guests looking for a place to relax are spoiled for choices: for the pool and pool deck, there are 8 deck chairs and 2 loungers; the covered patio has an 8-seater weatherproof wicker patio set with overstuffed cushions to give you a comfortable place to relax when the sun gets too hot, and 4 bar stools at the kitchen island bar give you a place to enjoy your after-beach or after-pool drinks. For extra convenience, there is even a bar on the porch for those who don’t want to make the trek inside for their drinks. Samaan Grove Development: The Samaan Grove Development is a gated development in Tobago, with 24 hour security. As guests, you can rest assured that you will enjoy quiet, peaceful, private and secure surroundings in which to enjoy your holiday. The development is ideally located, with the most popular beaches such as Store Bay & Pigeon Point to the south-west, and Grange Bay, Mt Irvine Bay & Stonehaven Bay to the north-east are all within 4-8 km and less than 10 minutes’ drive away. We are located off Milford Road and close to the Crown Point area, where there is a wide range of eating choices - from ultra-casual and take out, to fine dining. A fully glassed wall by the porch create a very bright and airy feeling in the great room. There is an uninterrupted view from the kitchen past the living and dining areas to the porch, swimming pool and pool deck ensuring that all the indoor and outdoor activities are fully connected at all times. This is especially nice when you have to keep an eye on your young children. Two bedrooms have en suite shower rooms, while 2 other bedrooms share 1 shower room. The great room is equipped with 2 split AC units as well as a ceiling fan. Each bedroom is equipped with a split AC unit as well as a ceiling fan. Smoking is not allowed indoors but on porch. Check-in : 2 PM | Check-out : 11 AM Check-in : 4 PM | Check-out : 11 AM [ During peak or high times ] - July, August (high times) Peak times: 18 December - 2 Jan 1-10 March, 2019 19-28 April, 2019 KINDLY NOTE : No Man's Land beach is no longer accessible from Samaan Grove The Great Room, encompassing the Living and Dining areas and the Kitchen, is also air conditioned with split air conditioners. On request, you can have a cook prepare private meals for you. This could be a wonderful way to experience local dishes in the privacy and convenience of the villa. HOUSE KEEPING: For short stays (2-3 nights), no housekeeping service is provided. For longer stays, the housekeeper will normally stop by on Mondays, Wednesdays, and Fridays. House was well appointed with everything one needs. Cleaning staff were very nice and replaced basic items. Safe neighborhood and close to many things. We appreciate your positive feedback about your stay at Blue Marlin. We do take pride in catering to our guests’ needs the best way we can. If you’re traveling to Tobago again, we would be more than happy to host you again. Located in a gated community this villa was very comfortable. Nice pool in the backyard with warm water. The villa was just as seen in the photos or maybe even better. Everything you could possibly need was provided and the staff was most courteous. Will surely revisit without a doubt. Thank you so much for your review ! We are happy Blue Marlin lived up to your expectations. We are looking forward to seeing you again. All the years I have been going to Tobago, this is a first. The house really lived up to the pictures, location is very easy to find. Minor details can be worked out e.g. soap stained wares drainer, spiders/cobweb by the bathroom window, someone left their bath suit on the laundry room shelf, was still there when we arrived. Otherwise everything else was awesome & very convenient. Theresa/ Tricia you both were amazing, booking was a breeze. Will definitely stay again. Blue Marlin, all I can say is WOW !!! My family and I rented this villa...and it was above and beyond what we expected. We certainly had a great time.. the bedrooms are spacious and the bathrooms are really up to the times.. alot of effort was put into designing this place... and my family would like to say thanks to the Blue Marlin Managment team, they are wonderful to work with. Theresa, thanks again. Blue Marlin Villa is located in the gated development of Samaan Grove. Samaan Grove is centrally located off Golden Grove Road in Canaan in the heart of South West Tobago, within 7-9 minutes’ drive of the popular beaches like Store Bay, Pigeon Point, Mt Irvine Bay. Close by is a wide range of eating places ranging from local take out and fast food to fine dining. Travel Directions: From the ANR Airport, proceed east approx 3 Km along Milford Road. Turn left onto Golden Grove Road and drive approx 1 Km until you arrive at the Samaan Grove entrance and guard booth. After gaining admittance from the security guard, drive into the development. Drive time from the airport is approximately 7-9 minutes. From the Port at Scarborough head west along Claude Noel Hwy towards Crown Point, turn right onto Golden Grove Road after passing Shirvan Road. Drive time from the port approximately 15 minutes. Leisure activities available nearby range from bicycle rentals, horseback riding, swimming, snorkelling, surfing, windsurfing, kite surfing, reef tours, deep sea and on-shore fishing, and sailing. Less than 8 minutes’ drive away, golfers have a choice of the Mt Irvine Golf Course or the PGA rated Tobago Plantations Golf Course. Popular supermarkets Penny savers and RT Morshead are just a few minutes’ drive away, while Canaan Food Basket is just around the corner on Milford Road, making it ideal for a quick run to stock up on fruit, vegetables and beverages. We highly recommend the following for eating experiences:In the Crown Point/Airport Area: La Cantina for genuine Italian style thin crust pizza from a wood burning oven - located in the Royal Bank Plaza, Skewers for Arabic style fast food, Chefs & BBQ for local foods selected cafeteria style, the Pasta Gallery for excellent pasta in a very casual setting at very economical prices just after the turn-off towards Pigeon Point from Milford Road. In Lambeau, Shore Things for casual eating in a lovely setting by the sea on the old Milford Road. In Pleasant Prospect Fish Pot Restaurant for fresh seafood close to the Grafton Beach/Stone haven Bay area. In Buccoo Village, La Tartaruga for great Italian food and a top class wine selection. In the Grafton Beach area, Seahorse Inn for international dishes on Old Grafton Road overlooking Grafton Beach. For local street food, there's a Doubles vendor who comes out most afternoons and sets up in the Stumpy's car park on Milford Road. For coconut bake or fried bake with salt fish or smoked herring for breakfast, you can't go wrong by buying from Golden Girls Bakery at the corner of Golden Grove Road and Milford Road - literally a minute's drive from Samaan Grove. They also make an excellent thick local soup (vegetable or cow heel) most weekdays including Saturdays but be warned - they are often sold out by noon! Check-in : 2 PM | Check-out : 11 AM Check-in : 4 PM | Check-out : 11 AM [ During peak or high times ] - July, August (high times) Peak times: 18 December - 2 January 1 March - 10 March, 2019 19 April -24 April, 2019 21 February - 1 March, 2020 09 April -19 April, 2020 KINDLY NOTE : No Man's Land beach is no longer accessible from Samaan Grove The rates shown are based on a group size up to 6 persons. For international guests, the cost for additional guest(s) is $16 USD per person up to a total of 12 guests. Maximum number of guests is 12 including children. Rates are shown in USD. Children under 3 years are no charge. The damage deposit is NOT applied toward the full rental amount, and will be refunded within seven (7) days of departure less any applicable damage deductions.